Rock and learn with the Turn and Learn Turtle! Turtle and his friends introduce baby to colours, numbers, animal names and their sounds! Press the buttons on the gears to learn numbers and animal names and twist the gears to add fun sound effects! Pull the turtle along to hear songs and watch his gears move! Introduces colours, numbers, insect names and their sounds. Pull the turtle along to hear songs and watch his gears go and his head bob up and down. Pull cord for pull along fun; Features 2 happy sing-along songs and 10 uplifting melodies. Flashing light on the shell to attract your baby! General information: Batteries required: 2 x AA (included); For ages 9 months and over. EAN: 3417761431030 WARNING(S): Only for domestic use. * 1086195 16.49. 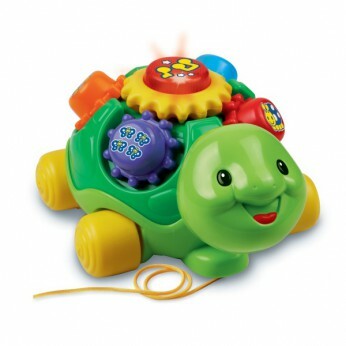 This toy costs approximately £15.99 (for the latest and best prices make sure you check our retailer list for the VTech Pull N Play Turtle above). In our review of VTech Pull N Play Turtle we classed it as being suitable for ages 1 to 3 years but recommend you check the manufacturer specific advice before purchasing.